We are so excited to receive a second piece of art from Helen Peyton, in celebration of the upcoming Ghost Cow Night. We think it captures perfectly the huge starlit skies of Swaledale with the curious ghost cows and the dark sleeping barns underneath. Perfect for Hallowe’en too! We’ve managed to get a sample mug made up through Snapfish. We like the layout – you can see it in the featured image at the top of this post – but the colour reproduction isn’t so good so we’ll do more work on that with a local supplier we have in mind. Our intention is to offer a set of up to four mugs to B&Bs and holiday cottages in the area to have for their guests with their complimentary coffee & tea. We ran two workshops for families in Muker earlier this week to help Handmade Parade make ghost calves for our Ghost Cow Night in November. We had lots of people turn up and everyone had a wonderful time, some families stayed all day and one little boy enjoyed himself so much he came back on his own and got into lots of trouble with his parents! We’ve just sent out a press release about the project now that we are reaching the final stages of the work. The first people to pick it up have been the Northern Echo who have published two rather nice photos that we’ve used on the blog. Read the full article on the Northern Echo’s website. You can see our full press release on the main Yorkshire Dales National Park website. Local farmer, and member of the choir, Rachel Hall, has also suggested she organise some reading of old poems about the area and sent us these photos of the poems in local dialect. She has people in mind to do them justice – we can’t wait. She told us that ‘The Swodil Teeups’ poem mentions a tup called Stone House Hero, bred by her grandfather, adding, “we farm it [Stone House] now, so it’s special to us”. Our two children’s half-term workshops making ghost calves for our November project celebration are taking place in Muker today and tomorrow. In the meantime, Handmade Parade are working on the two life-sized ghost cows which are going to head up our nighttime procession and they’ve just sent along the first photos of work in progress. We have several businesses coming in to collect items that they have ordered from us on 2nd November so today we are very busy framing up all the cowhouse posters and pictures. It will be lovely to see them all going out to new homes where they will be appreciated by hundreds of future visitors to bed & breakfasts; holiday cottages and guest houses up and down the dale. Once we’ve cleared away the last of the bubble wrap, then we will be moving on to packaging up our sets of walk booklets. All six have now been printed and they are already getting a great reception from trial users. We also showed them to Destination Dales, the tourism business steering group, and they were very enthusiastic and wanted us to let them know as soon as they were more widely available. The field barns of the Yorkshire Dales often inspire people in different ways. A local artist, Sue Dewhurst, has created an exhibition of her own paintings that display the beauty that she sees in the barns of the Dales amongst other amazing aspects of the area. The exhibition, entitled ‘Dales Unveiled’ features many familiar barns from within the Swaledale and Arkengarthdale Barns and Walls Conservation Area. The paintings are currently on display in the Yorkshire Dales National Park Authority Offices in Bainbridge and will remain there until mid-December. Entry is free so pop in during office hours, Monday to Friday, and take a look at this wonderful collection. We have commissioned musician Geoff Garrett to work with a local choir on a song to call our ‘ghost cows’ down off Kisdon Hill as part of our end of project celebration called Ghost Cow Night. We were out yesterday testing the acoustics around Keld. Farmer John Rukin has kindly given us permission to hold the event in and around Myers Bottom cowhouse and he came out to have a chat with Geoff about the various cow calls he uses and the correct pronunciation of the Swardle dialect words Geoff is using in the composition. We were inspired by the spine-tingling Scandinavian cow calls which are known as kulning. If you are on Facebook – there’s an amazing film of Jonna Jinton calling the village cows home for the winter – follow this link and turn the sound up. The next four interpretation panels have just been delivered and are now awaiting transport on to Hawes where Michael Briggs, the ranger for Swaledale, will collect them ready for installation. The unwrapped panel is about Banty Barn on the Buttertubs Road. We were delighted to obtain permission to site this panel up at the Muker Millennium Cairn viewpoint which overlooks the first cowhouse you come to in the parish from this direction. A great place to introduce the Every Barn Tells a Story project to visitors. Others are for the Rukins campsite car park in Keld; the centre of Muker village and along Occupation Road out of Muker. 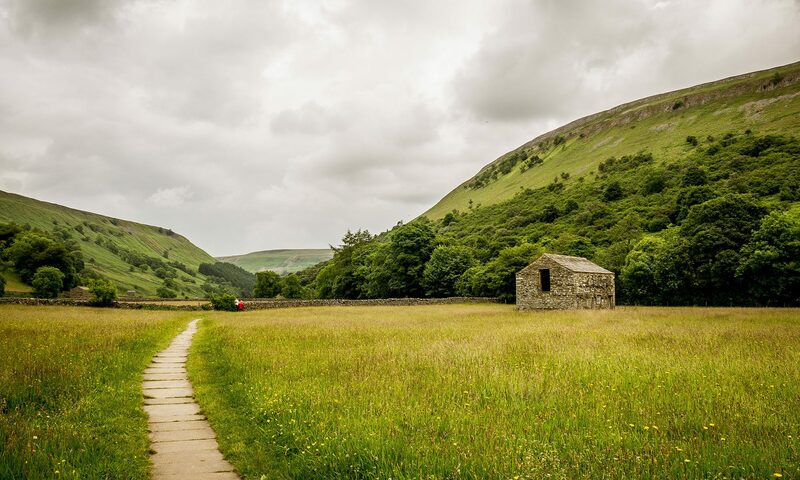 The Coast-to-Coast long distance path runs right through Upper Swaledale and many visitor businesses cater for people who are walking the route west to east. The feedback we got from accommodation providers was that they’d like some information about the local cowhouses that they can print off cheaply and hand out to their guests before sending them on their way. We’ve come up with this DL-sized leaflet which can be printed off in both black and white or colour and which businesses can either add to their websites or have ready printed for visitors to pick up. We’ll be sending it out via email shortly to everyone who has expressed an interest.